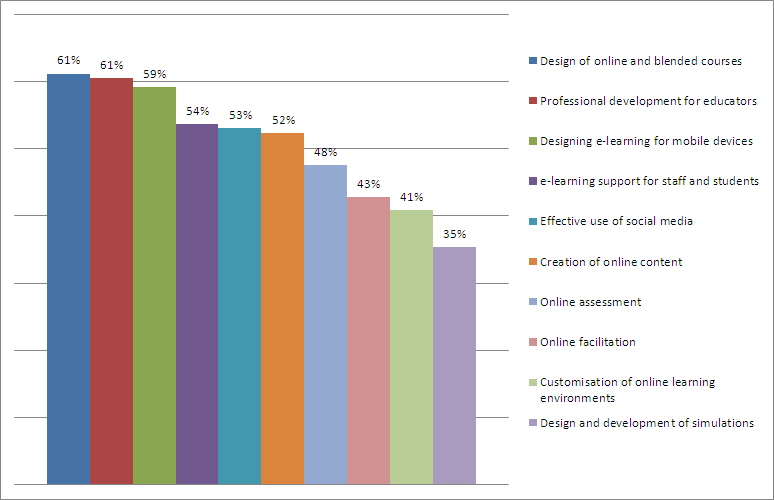 The 148 respondents to the e/merge Africa Needs and Priorities Survey in 2013 were asked to assess the capabilities most needed for e-learning in their respective institutions. Their top three priorities were design of e-learning courses, professional development for educators and designing e-learning for mobile devices. These were each mentioned by between 59% and 61.5% of respondents.The fourth most chosen capability was e-learning support for staff and students which was mentioned by 54% of the respondents. The need for social media skills mentioned by 53% of respondents may be slightly understated due to an error in the survey design. This entry was posted in Reports by Tony Carr. Bookmark the permalink.